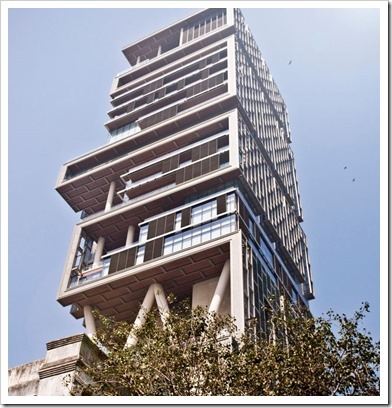 Reliance Industries Chairman Mukesh Ambani’s house Antilia has been declared as World’s most expensive house by Forbes. Having estimated construction cost between $1 billion – $2 billion, this 27 floor, 400,000 square feet skyscraper in Mumbai has beaten all the houses owned by billionaires all over the world. The name Antilia has been inspired from a mythical island by the same name in The Atlantic ocean. It has 6 stories of underground parking, three helicopter pads and a team of around 600 staff members who maintain it 24 hours. In a list of the most expensive houses owned by billionaires all over the world, Forbes said, “The title of the most outrageously expensive property in the world still belongs to Mukesh Ambani’s Antilia in Mumbai,”. To give an insight and to describe it’s hugeness, Forbes said that Antilia can be compared with ‘7 World Trade Center’, which is a 52 storey tower standing at Ground Zero in Manhattan. At rank #2 is Lily Safra’s Villa Leopolda, in Villefranche-sur-mer, France, which was built by King Leopold II of Belgium for one of his mistresses. Constructed on a huge canvas of 20 acres, it was worth $750 million in 2008, when Russian billionaire Mikhail Prokhorov tried to acquire it, but failed. At rank#3 is Fair Ira Rennert’s huge mansion in Sagaponack, in New York which is worth $248.5 million as of now, and is considered USA’s most expensive house. India born Laxmi Narayan Mittal’s two houses in London’s Kensington Palace Gardens occupies 5th and 21st position in this list. These houses are located in the highly secured street in London known as ‘Billionaires Row’, where one of his houses was valued at $222 million in 2008. The 55,000 square feet mansion was purchased from billionaire Bernie Ecclestone and after renovation was named as ‘Taj Mittal’. It is said that the marble used for this house was procured from the same quarry which constructed Taj Mahal. You can get the complete list of the most expensive houses here. "Mukesh Ambani’s Antilia Remains World’s Most Expensive Billionaire Home", 5 out of 5 based on 1 ratings. Is Amazon Missing A Trick Here, While Flipkart Sells Motorola Exclusively?